Three Sheets to the Sea takes its name from the nautical expression ‘three sheets to the wind’, meaning to not have command over a vessel because one had lost control of the sheets or lines’. It is an evening in three parts, responding to the Remembrance Day for Lost Species, which happens on 30th November each year. Taking on the theme of islands and seas, we shall weave through the story of a long extinct sea algae that created the conditions for other species to thrive, whilst making the climate inhabitable for itself. This is presented alongside everyday tales of humans and other beings intertwined in capital-climate-crisis. Performative-poem-talk drags us on a multisensory journey from the early evolutionary life of sea organisms, to our present condition, and onwards to a future of robotic sea dwellers. This is followed by a participatory workshop exploring our experience and emotions as we take part in ritual remembrance for lost and forgotten sea species. 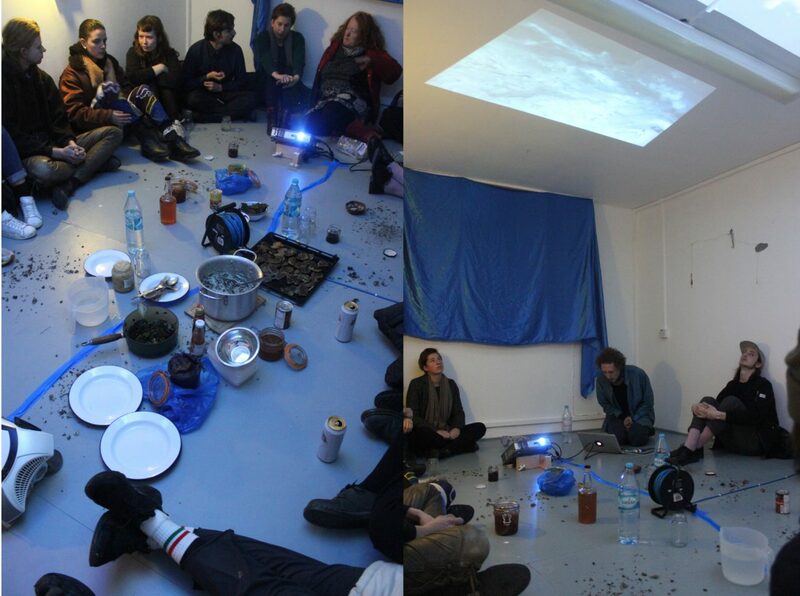 To close, we will hold a wake together, with probiotic and oceanic foodstuffs, to feed and facilitate a shared discussion around the themes of supply chains, climate change, extinction and our place within it all.